To celebrate our recent website re-design and our new Facebook page, we are giving away a $20 gift card to one of our lucky Facebook friends! Once we get to 100 “likes”, we will randomly pick one of our Facebook friends to receive the gift card. We are currently at 77 “likes” so start encouraging your friends and family to “like” Bayfront Bistro on Facebook and as soon as we hit 100, we’ll announce the winner! Good Luck! 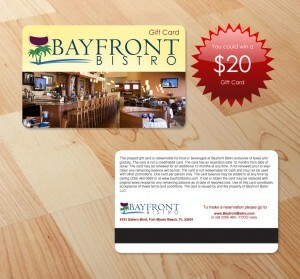 To “like” Bayfront Bistro on Facebook, you must visit the following page – http://www.facebook.com/BayfrontBistro and click the like button beside our name, or you can click “Like” in the Facebook box on the right hand side of most pages on our website.